A man walks past the logo of Baidu at its headquarter in Beijing, 2010. China's top online search engine Baidu has apologised on state television following a barrage of criticism by official media over allegedly fraudulent advertisements. China's top online search engine Baidu has apologised on state television following a barrage of criticism by official media over allegedly fraudulent advertisements. The state-run China Central Television (CCTV) earlier this week claimed users of the Nasdaq-listed Baidu were losing money on phoney airline tickets allegedly sold by advertisers on the search engine, among other charges. CCTV's business channel also aired footage of an undercover journalist receiving coaching from a man who appeared to be a Baidu staff member, on how to get approval for pharmaceutical ads using a fake business licence. In a live broadcast late Thursday, Wang Zhan, vice president of sales for Baidu -- which accounts for more than three-quarters of China's Internet search market -- apologised "to users affected by the fraudulent information". "We are reviewing our sales and approval process to try to plug loopholes as soon as possible," he added in comments reported by newspapers Friday. A spokesman for the search engine declined to comment on Friday. This is the second time that Baidu has come in for strong media criticism, after state television blasted its advertising practices in 2008, forcing it to revamp part of its business. At the time, CCTV criticised Baidu for allowing advertisers to pay for space alongside top search results, without labelling it as an ad. Analysts said the latest round of criticism could have hidden motives, such as government worries over the company's near-monopoly on Internet search in China, or attempts by competitors to erode its market share. Besides Baidu, CCTV has also previously targeted "weibo" -- Twitter-like microblogs -- for spreading rumours after a deadly train accident last month, according to Jeremy Goldkorn, founder of a Beijing-based web research firm. It has also attacked global Internet giant Google -- which partially moved out of the Chinese market last year amid a public spat with Beijing over censorship -- for illegally spreading pornographic content. "There certainly is a strategic aim behind it and sometimes a political aim," said Goldkorn. "The context is CCTV and all the central government news and propaganda services are threatened by newer Internet services, particularly ones that are not run by the state," he said. During the television broadcast, Wang pledged Baidu would make more efforts to filter illegal information. When asked if the company would change its business model, he replied the Internet environment was "indeed complex" and Baidu would use technology and staff to eliminate fraudulent information. Baidu shares dropped 6.7 percent on the Nasdaq Thursday, bringing total losses so far this week to more than 14 percent in a jittery market environment overall. The firm's major rival remains Google. However, Baidu also has a number of Chinese competitors, including new search engines backed by state media giants like Communist Party mouthpiece the People's Daily and the Xinhua news agency. Li Zhi, analyst at Internet research firm Analysys International, said that despite the drop in share price, the criticism would have little impact on Baidu's revenue since its advertisers had few other options to turn to. 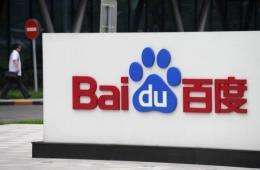 Baidu might become the focus of future government regulations to ensure it properly reviews the business licences of its advertisers, but there was a limit to the firm's responsibility, she said. "Even if Baidu does properly review business licenses, can it ensure advertisers are doing business legitimately and selling products in the interest of consumers? This is open to dispute," Li said.